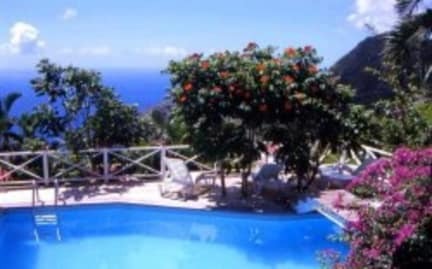 El Momo Cottages, Saba, Antyle Holenderskie : Rezerwuj teraz! Nestled high up on a green, Caribbean mountain the place to 'free your mind' awaits. Nature lovers who enjoy priceless amenities like tropical flowers, palm trees, hammocks overlooking a deep blue sea and warm hospitality will find El Momo to be the perfect retreat. A set of stairs leads to six small wooden cottages and a small apartment each surrounded by tropical gardens. The whole property is located on a hillside above another property, so it's quite a climb! The airy 'one room cottages' are built of warm wood and decorated with original artwork. Each cottage offers an amazing ocean views from its terrace and provides a private atmosphere. Handmade wooden furniture and individual colorful fabrics add a touch of Caribbean happiness. Mosquitoes are very rare, so you can sit on the terrace enjoying the sunset without any repellent. No safes or keys are necessary, because crime simply does not exist. El Momo is small, individual, earth-kind, quiet, very charming and a little 'Robinson Crusoe like' with plenty of unspoiled nature. A little piece of paradise where time moves slowly and attention is paid to details. Experience the busy hummingbirds as they fly from flower to flower, the little black dotted Saban lizard puffing its yellow chest, or the whistling tree frogs in the star filled night. Sleeping well is easy as the altitude climate cools down at night. In addition to the breathtaking sea views you can enjoy fantastic ocean sunsets from October to March. The wooden swimming pool deck is built around African Tulip Trees which provide natural shade for the cozy lounge area. An eco friendly philosophy complements the beautiful natural environment and keeps tourists footsteps small. El Momo is facing towards south-west which provides sunshine all day long and the hill in the back protects from too much wind. the hotel is a tranquil heaven where a maximum of 14 guests rest and enjoy nature at its best. We take the time to provide background information and give tips concerning activities and dining. We work closely together with Sea Saba Dive Shop and Saba Deep Dive Shop and can assist you in arranging your diving desires. Do you rather stay above water? We will explain you all you need to know about the many hiking trails on the island. But if you want to have a more relaxing day we can also make a booking for a spa treatment, a yoga class or a workshop at Jobeans Glass Art Studio. El Momo offers a wireless dsl service for guest who bring their own laptop. 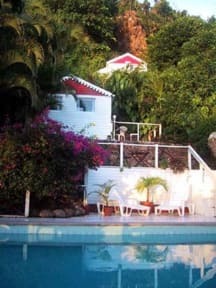 Saba is an amazing paradise for nature lovers, divers, hikers, artists and people who just like a safe place to unwind - no pressure and far away from the mad rush of 'the real world'. Saba has not much night life, no big resorts, no casinos, no big cruise ships, no sandy beaches (thus no mass tourism), no fast food chaines, but spectacular unique marine life, amazing rain forest, a unique historic architecture style and very friendly people. This island is a rough and steep beauty. You will feel like sitting in a time machine and driving back many years. The high altitude climate is very pleasant and cools down at night. During winter season, the night temperature is as low as 68F/20C degrees. All rooms have sea view, from Oct-March even ocean SUNSET!!! All bathrooms have hot water showers and most showers provide sea view. During the winter season, we require a minimum stay of three nights. Exceptions are possible in case of last minute bookings. We add NO mandatory service charge. You are the one deciding at the end of your vacation if you appreciated our personal service or not. The sales taxes are also paid by us, we include them in all shop items, drinks and food. We do ask you to donate $1 per person per night as a voluntary maintenance fee for the national park. We always prefer cash US Dollars or traveller cheques, but we do accept Visa and Mastercard. Anyhow, on Saba sometimes there are additional fees charged for credit card payments, so better bring some extra cash. Please do not bring any Euro or EC Cards, since those are not accepted. The El Momo breakfast is very popular and includes homemade bread, a fresh fruit plate, cheese, eggs any style, homemade natural yoghurt with granola, orange juice, butter, marmelade (enjoy our famous homemade banana marmelade! ), honey, good coffee and a great selection of tea. Also available are choices of sandwiches, fruit salad, ice cream, homemade cake, local fruit, freshly squeezed juices, cocktails and once a week we offer a homemade specialty dinner. The two-course dinner offers a choice of fish/seafood or vegetarian and cost $16 to $20 including tax & service.